Ile-alatau National Park is a national park created in 1996 in Kazakhstan. This expanse of 490,000 acres includes diverse landscapes, and flora and fauna. Woodlands, meadows, glaciers and lakes make the landscape structures variant. 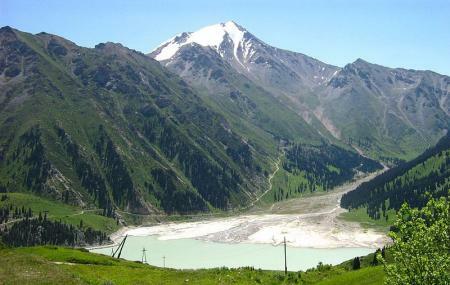 The park also includes the mighty Big Almaty Lake. While apricot, maple and apple trees dominate the range of flora, fauna includes around 300 species of birds and animals. You can spot Snow Leopards, Central Asian Lynx, Tian Shan Brown Bears, Bearded Vultures and Golden Eagles. If you’re lucky, some of the exotic animal sightings that you could have are of Himalayan Snowcock, Ibisbill, Eurasian Scops Owl and Eurasian Three-toed Woodpecker. The park is visited during the winters to enjoy the snow-capped mountains, but the park is remarkable all year round. Abounding of places like Grand Aiser, Arbat, Korean Restaurant, Medeu and Bread House Georgian Restaurant, city name has great things to do that are totally worth your time. Use Almaty trip planner to visit Ile-alatau National Park and many others to your visit. Book perfect hotels in Almaty like Ambassador, Astra Hotel, Mildom Hotel and Resident Hotel Delux. Create your own Almaty vacation packages or choose from the ones made by travel experts. Also explore the best ways for how to reach Almaty. How popular is Ile-alatau National Park? People normally club together Shymbulak Ski Resort (base Station) and Shymbulak while planning their visit to Ile-alatau National Park. Great place for a hike. The lake looks like a mirror if you visit early and the wind hasn't started blowing yet. The scenery is quite amazing and the view is worth the trip. You can come with a car most of the way and hike from there. Some areas are restricted. Beautiful mountains, fantastic views and of course the Big Almaty Lake. Always worth a visit, but take your rubbish home please!